"An authoritative, jaunty and enjoyable account of their sometimes comical, sometimes impressive and sometimes disquieting misdeeds. . . . The author's love of his subject pervades Exploding the Phone and persuaded this reader, at least, that the phone phreaks are worthy of thoughtful attention." 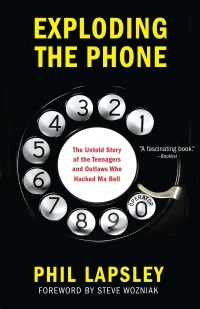 "A rocking great read about the unknown teenagers and hobbyists who defied AT&T when it was foolish to do so. In Lapsley's magnificent research he has uncovered what amounts to a secret pre-history of the computer and internet revolutions." "A brilliant tapestry of richly detailed stories ... a first-rate chronicle of an unexamined subculture." Why are you writing a book about this? Glad to hear it. It's called Exploding The Phone and you can buy it from Amazon, Barnes & Noble, IndieBound, or Books-A-Million, or most brick-and-mortar bookstores. Please see the book's web site for more information. You may also want to sign up for the mailing list ... and don't forget to check out my blog.